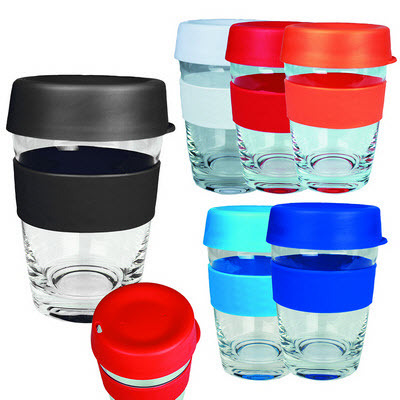 Description: 340ml glass coffee cup with push down PE lids and silicone bands available in a range of colours. Available in 6 colours or mix-and-match lids and sleeves in up to 36 combinations. Features: The glass carry cup is supplied in a folded cardboard box for protection Packaging: UNDECORATED: Supplied in plain white tuck box with Lids and Sleeves shipped seperately. DECORATED: Supplied in plain white tuck box with Lids and Sleeves attached. Colour: Black, Blue, Pale Blue, Orange, Red, White Material: Glass, Silicone Product Size: 130mm(h) x 80mm(w) Freight details : 50 per carton, 12kgs, 52 x 51 x 33cms; Decoration Type(s): Colour Print Decoration Area: Print: 35mm(w) x 25mm(h) under band, 25mm(w) x 25mm(h) on lid, 60mm(w) x 20mm(h) on band for 1 colour OR 40mm(w) x 20mm(h) on band for multi-colour. Price includes : Item incl 1 Colour Print on Cup, Sleeve or Lid. Setup is included.